In Splash Damage's Brink, rival factions do battle over the fate of a post-apocalyptic floating city called The Ark. Judging by the critical reaction of some video game critics, The Ark may have already sunk. Brink's intriguing combination of class-based team shooting a free-running movement have kept it high on gamers' radar throughout its lengthy development cycle. It's distinctive visual style, unique setting, and countless character customization options only fueled the fires of anticipation. Now the game is live in North America, and as gamers run rampant over The Ark for the first time, the assembled game critics have already been there, done that, and painted an often disparaging picture of the future of this floating utopia. Here's one of the first major problems with Brink's objective-based structure: Each level that a player earns lets them unlock a new ability. Though there are a few permanent boosts the player can spend their unlocks on, most of these abilities are class-specific, meaning eventually, you're going to find a class you like and spend most of your points on it. Naturally, you'll have a predilection to play as that class — but should you refuse to switch your class to suit the objective, you're going to feel like your services aren't really required three-quarters of the time. Brink's one shining aspect is SMART (Smooth Movement Across Random Terrain). Using SMART, holding a single button lets you navigate up walls, over obstacles, and through the game world. Depending on your body size, you can do more or less with movement, but overall this finesse is fantastic. Nothing in Brink feels quite as good as sliding under gunfire into someone, taking them out with a shotgun. However, it's easy to forget which size your character is in first-person perspective, as movement abilities don't change dramatically. While the Large size allows miniguns and shotguns, they still move only slightly slower than the Medium size. Only Small characters can really burst through levels, leaping off of walls and finding clever passageways. My central beef here is that anemic feel to the action. I love complexity in games like this, and strategizing how to utilize the varying skills of the different player classes to achieve your goals. But when the core action doesn't feel good, it kind of weakens the entire venture. When I shoot an enemy, especially in the head, I want them dead. Not laying on the ground waiting for a medic to revive them, dead. Especially when I pop someone in the head. If there is a cardinal rule of shooters, it should be that no one survives headshots. No one. While some of the levels have a more even chance of success for either side, I have a feeling there are certain stages that players are going to eventually refuse to play, rage-quitting should they find themselves on the wrong side. Had Brink employed something similar to Killzone 3 — where objectives constantly shift and are evenly split between teams — it might have worked. Instead, the game has a totally bizarre flow where even if a team is dominating an enemy and wins two objectives, they can still lose a hard-fought match because they failed the third imbalanced requirement. Brink deserves to be ranked among the finest co-op games available. As a multiplayer experience, it is exquisite. But as mentioned earlier, it falters if played solo. While all the modes can be played in single-player, the bots that act as stand-ins for other players are a poor replacement. It certainly isn't the case that gamers who buy Brink will feel ripped off if they don't have access to their console's (or PC's) online network. But until you've fought both with and against living opponents in Brink, you have yet to sample the best of what it has to offer. That's an awfully sharp rise to slightly above average. 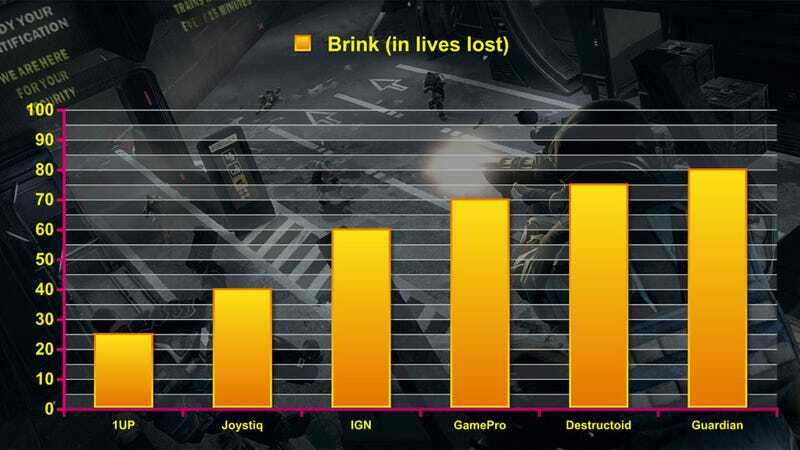 Brink is now available for the PlayStation 3, Xbox 360, and PC.